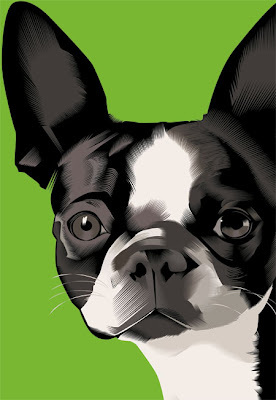 This Boston Terrier is the beginning of a new body of work on dogs. Happy dogs, leaping and snarling dogs, play on words dogs, playful dogs, faithful friends. Canine confusion. Canine cacaphony. There is a world of opportunity to this content and I am psyched. This head is from a dog I am working 24' x 36" and found I was getting way too tight. This final image is 13" x 19" with the detail still holding. I started with black and worked in the midtones and highlights and have questioned this approach, but I like how the black makes a lot of decisions for me...and I can really block and tackle with the highlights and midtones in a very simple way. So...you will see this evolve. There will be a sidebar blog to the Rongovian Academy of Fine Arts relating to this body of work...showing work in progress. Look for A Pound of Rongovia to see the work progress. Clicked to this interesting site from The Little Chimp Society called Illosaurus. This is a british site whic is "the brand new listings and information portal for illustrators, cartoonists and image makers". There are links to AOI (Association of Illustrators) and other big british sites for illustration, cartooning etc. They have some sketchy vendor lists (feels brand new--I am hopeful this will expand)-- with a cool link to a teeshirt vendor in California, Ape Do-Good Printing. Not clear on the printing but they talk about Pantone colors, special colors and have templates in Adobe Illustrator to download to comp the designs for designers. Very proactive. They also print posters. I will call to find out if the posters are screenprinted etc. Right attitude. Right tools. Cool blog to point to their cool friends and customers.Could be a nice supplier for all of us to have. Just got a postcard from City Colors(? ?anyone know them)who are big and cheeeeeeeeeeeeeap. Here's a "for instance"--500 postcards, 4/0 ($45), 500 postcards 4/1 ($50). These are good prices. I will need to get a business card printed from them (4/0) 500 qty for (yes, folks, what's wrong with this equation) $15. So, I owe you something on that. We had the happy Festival of Flowers today in Tburg. Visited the new Main Street Art Pharm, a group of artists who have studio space and a shared gallery with an enterprising woman who makes lovely natural cosmetics. Best wishes to all of these engaged artists. Rumor has it that the old Holton pharmacy space is being divided to be a used bookstore and in the other half, an optician with glasses. So, more services and more retail on Main Street. Volume Records, our used and new music store has moved down to the Commons in Ithaca--and that space is being taken by a sweet shop. More novelty. Ran into all sorts of fun people in my travels. It was energizing to be amongst the tribe.